Eyelash extensions is a way to enhance the length, curliness, fullness, and thickness of the natural eyelashes. The Eyelash extensions give an appearance of having mascara on without the messy clumps and smudging of makeup. The possible materials to manufacture eyelashes include mink, synthetic, or horse hair. This type of eyelash extensions usually last around 3–4 weeks and naturally fall out. After those 3-4 weeks, new lash growth will need to be bonded again. 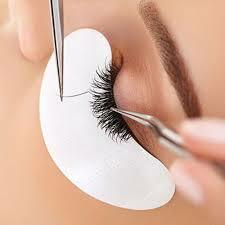 There are various types of eyelash extensions. Such type of eyelash extensions add length and volume to your natural eyelashes. It is a temporary solution for one to three days. Thease are good special occasions. Temporary false lashes Temporary lashes are applied with temporary lash glue. You cannot wear them while showering, sleeping or swimming. Semi-permanent eyelashe extensions, usually known as individual eyelash extensions, are eyelashes applied with an adhesive called cyanoacrylate. Lash adhesives are made from methyl-2-cyanoacrylate and designed to bond a smooth surface (the eyelash extension) to a porous surface (the natural eyelash). This adhesive causes irritation if it touches the skin so application precautions are needed. To beautify your face we also offer full face massage, eyebrow threading and tinting and facial treatments. Generally, a single lash is applied to each natural lash with a special glue one by one. it akes long time. It is process of an extensive care. While applying semi-permanent eyelash extensions the main focus is upon that none of the glue or eyelash extension should not touch to the lid skin. The special care needs to prevent the eyelashes from sticking together. To maintain the full look, lash extensions is a regular monthly service. For such type of treatment we need a skin test 24 hours before the treatment. This test is known as patch test. We apply false eyelashes like Adele and Katy Perry are wearing to make a perfect look of face and add a new impressive look. There are three types of eyelash extensions are available and we offer all, book an appointment, visit us, discuss and choose what you want. All the above actions may remove your semi-permanent eyelashes.